Rooted in tradition and tales of brotherhood and mystery, the Scottish Rite Cathedral Association Valley of Chicago needed to lay the cornerstones for a new home. After 100 years at its downtown Chicago location, the building could no longer meet the needs of the Scottish Rite, a division of the Freemasons. A move to the suburbs would give the fraternal organization the room it needed for its current members and the possibility to grow. And so a 16 acre site in Bloomingdale was chosen and construction began soon after. But, before the move, the organization stripped woodwork and artifacts out of its downtown location as a way to bring the history and traditions of the brotherhood with it. Marc Adelman, principal with tvsdesign, said the firm worked to integrate as much of the woodwork and artifacts into the design as possible – all to tell the story of the Freemasonry’s symbolic origins. Featuring traditional masonry materials such as stone and brick and reused materials like 100-year-old millwork and doors, the new building executes timeless, yet contemporary, design. As a Masonic Lodge, the new building features executive suites, a lodge hall, museum, library, kitchen, bar, and game room. Because the members of the Scottish Rite receive new degrees by watching or participating in theater productions centered around teaching lessons, the new Valley of Chicago Scottish Rite Cathedral also includes a theater complete with backstage elements. Intricate costumes and scenery that date back to the early 1900s call for storage rooms with special HVAC systems. One of the most important rooms in the lodge is that of the Grand Hall. Because the Scottish Rite holds events and reunions where nearly 300 people attend, the building needed a way for all those in attendance to move quickly and easily from the banquet hall to the theater. The Grand Hall does so while reflecting tradition and symbology, specifically the tradition of strict geographic orientation. 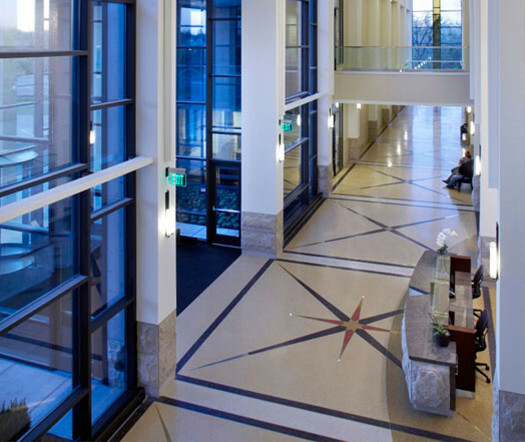 The rhythm created by the terrazzo unites the symbolism throughout the building. The red, gold, tan, and black colors of a double-eagle mosaic located behind the reception desk are reflected in the compass pattern. According to Adelman, no other material could combine tradition; symbolism; modernism; and craftsmanship, the premise behind the Masons, like terrazzo.